More than likely Carl Sandburg and his playmates created a telephone of their own. It consisted of two empty tin cans from the kitchen and a piece of string or wire. When attached together and held taut, two boys could talk to one another. This acoustic telephone had been known for centuries. Only one person at a time could speak because the mechanical vibration travels only in one direction. It was great fun for the boys to carry on a conversation while standing a short distance apart. During the nineteenth century, many men around the world worked to invent a speaking instrument which would carry sound for longer distances. The electrical telephone depended upon the invention of the electrical telegraph. The invention of the microphone and transmitter were essential for the development of the telephone. The earliest telephones had only one wire for sending and receiving sound. Individuals took turns listening and speaking and/or shouting into the one opening. On March 7, 1876, Alexander Graham Bell received a patent for his version of the telephone, which eliminated many of the problems of transmission and reception. 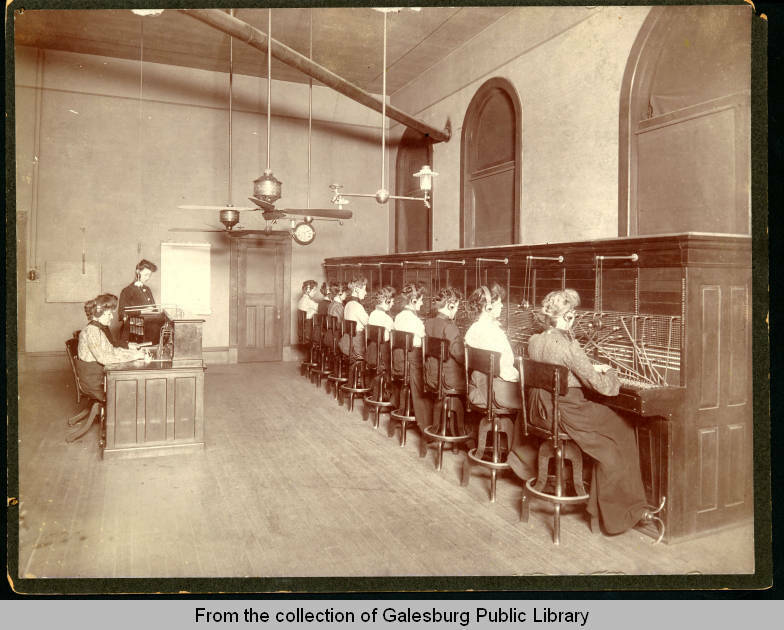 According to an article on the front page of The Evening Mail on September 24, 1896, Galesburg soon would be receiving long distance service to New York City. A line was being built from Princeton, which was already connected to Chicago and St. Louis. The caller could decide to have the call go through Chicago or St. Louis. When the connection was made in Chicago, the operator would ask the caller which way to send the call. Calls could be routed through Toledo, Cleveland, Niagara Falls and Albany down the Hudson River to New York. Or, the call could be sent from Chicago to Terre Haute, “smokey” Pittsburgh and Philadelphia to the number in New York. Presumably, the different lines were owned by competing companies. There were eight lines out of Chicago. Long distance telephone lines were used by stockbrokers, government offices, banks and large corporations. Their telephones were often installed in a sound-proof booth. Only the wealthy could afford to have a telephone in their homes. The cost of the long distance telephone call to New York in 1896 was $2.50 for three minutes of conversation. The cost in today's money would be $71.80. It was sometimes necessary to make an appointment to use the telephone. For many years, the transmission of telephone conversations relied on wires and cables. Nowadays, with the increasing use of cell phones, those conversations require transmission towers and satellites. Many wonder if they are any more reliable and secure. For these people, the jury is still out.